The video of the railcar panel at Cowen's 10th Annual Global Transportation Conference is available below. The discussion spanned a wide array of topics, including the sustainability of the demand recovery, investment in railcar assets by financial institutions, lease rates, the North American fleet dynamics in 2017, and realistic best-case and worst-case scenarios for railcar demand. Rail Security: Are We Safer? 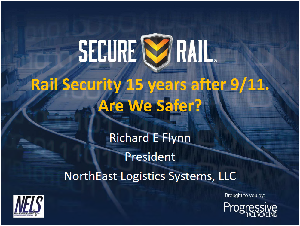 Richard Flynn's assessment of the rail industry's security strengths and vulnerabilities was presented at the 2017 Secure Rail Conference. The rail industry has made significant strides in rail security, particularly with respect to the transportation of hazardous materials while in transit. His presentation reviews the current state of rail security with an emphasis on legislative and voluntary actions to reduce vulnerabilities as they relate to recent terrorist tactics, and offers recommendations to further strengthen the U.S. rail network. Please submit the following form to download the presentation!